Next week at Maine Crime Writers there will be posts by Maureen Milliken (Monday), Kathy Lynn Emerson/Kaitlyn Dunnett (Tuesday), Lea Wait (Wednesday), Barb Ross (Thursday) and Susan Vaughan (Friday). 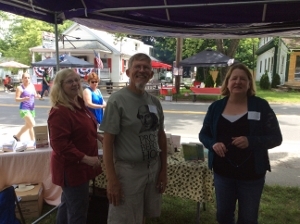 Don’t forget that today (July 4th) MCW regulars Dorothy Cannell, John Clark, Kaitlyn Dunnett/Kathy Lynn Emerson, Maureen Milliken, and Lea Wait, together with recent guest blogger Kelly McClymer, will be signing books from 11-2 at the Belgrade Lakes 4th of July Festival in Belgrade Lakes, Maine. For those who want to stick around, there’s also a frog jumping contest at 5PM and fireworks once it gets dark. Here’s a look at our venue, ready and waiting. I’ll try to post pictures later in the weekend to show what it looked like with people crowding around to talk to us and buy our books. As promised, a few pictures from Belgrade Lakes on the 4th of July. And a lot of fun, too. Monday, July 6th at 7:00 p.m. Dorothy Cannell and Kate Flora will be at the library in Castine, sharing writing secrets, research stories, and where our characters come from. 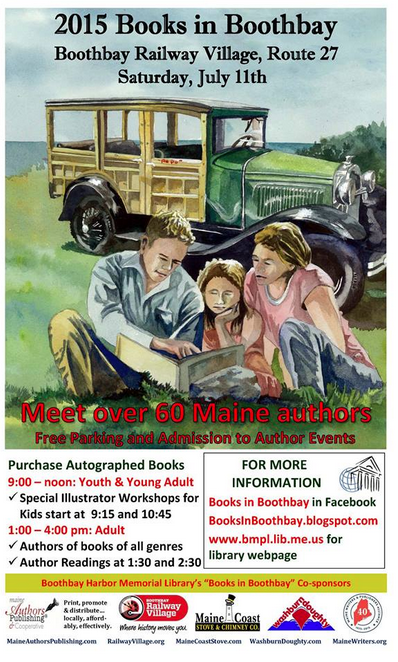 Next Saturday, July 11, is Books in Boothbay, held at the Boothbay Railway Village in Boothbay, Maine. 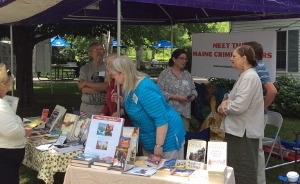 Many, many Maine authors in all genres, including Maine Crime Writers. The morning is for children’s and YA books, the afternoon for the rest of us. (P.S. That means Lea Wait will be there all day — from 9 until 4.) Check here for more details. We’re likely to be giving away fun things, like books and cookie cutters (moose or lobster, anyone?) perhaps even a cool tee shirt from Liberty Graphics. What’s your favorite Maine book? We’d love to hear what it is and why you like it. 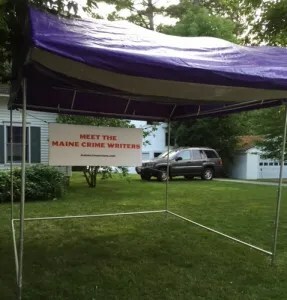 We recently heard from Mainely Murders Bookstore that their customers love the mystery, The Maine Mulch Murder, written by John Clark and Kate Flora’s late mother, A. Carman Clark. Rumor has it there may be another Amy Creighton mystery, The Corpse in the Compost, coming in the next year. If you’d like your own copy of The Maine Mulch Murder, share your favorite Maine book with us…and you could win one. 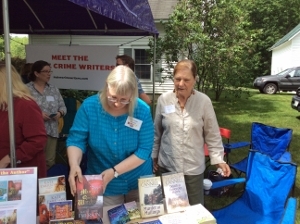 This entry was posted in Sunday Updates and tagged A.Carman Clark, Amy Creighton mysteries, Barb Ross, Belgrade Lakes 4th of July, Books in Boothbay, Castine Library, Dorothy Cannell, John Clark, Kaitlyn Dunnett, Kate Flora, Kathy Lynn Emerson, Kelly McClymer, Lea Wait, Maine Crime Writers news, Maureen Milliken, Susan Vaughan, The Corpse in the Compost, The Maine Mulch Murder. Bookmark the permalink.